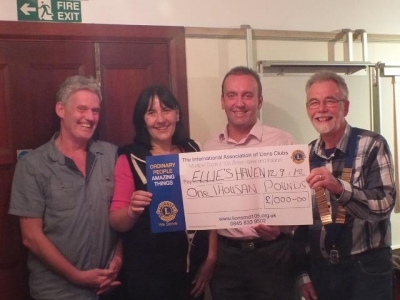 Last night following the breaking news of the acquired property for Ellies Haven, Julie and I attended a cheque presentation organised by the Lions Club Of Looe. We were presented with a cheque for £1,000 raised from this years 'Fancy Dress Three legged Race', which was great success. We would like to thank the lions club for giving us the opportunity to tell them of our progress and for their organising of the event.the businesses that supplied the prizes, and of course all the Public Houses who took part. Thank you so much.